Howard Wiley & The Angola Project features Wiley investigating the roots and legacies of African American prison spirituals, encompassing folk, blues, and gospel, with a focus on the songs and stories from the Louisiana State Penitentiary in Angola, Louisiana, from the 1950s onward. Before the performance, Daniel Atkinson and Howard Wiley came out and explained the program for the evening. Atkinson is currently studying at the University of Washington, completing his Master’s degree in Ethnomusicology (the study of people making music.) He has traveled down to the Lousiana Penitentiary several time for his Master’s thesis research which has greatly influenced his work with Wiley. It was an amazing performance and an incredible interpretation of the music from this period. The set included the amazing original compositions “Angola” and “Second Line” and a spectacular rendition of the classic hymn “12 Gates to the City.” Wiley and his band were vibrant and energetic. The music created a variety of moods from the playful to the thought provoking. There was moment in “Angola” when vocalist Jeannine Anderson matched Geechi Taylor’s trumpet note for note like we were being taken up into the heavens. It was a riveting experience. 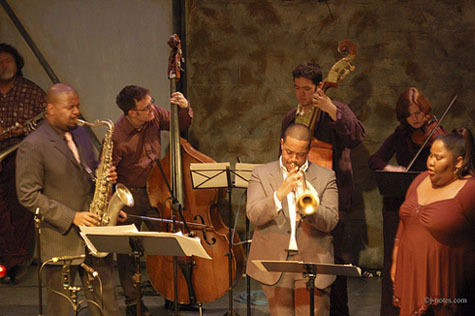 This performance was part of the jazz series at Intersection for the Arts in San Francisco where Wiley serves as the Artist-in-Residence. It is a great space for art and music. Howard Wiley & The Angola Project will be performing at Jazz at Pearl’s on February 23 and 24. Howard will be celebrating his birthday and the release of the Angola Project CD. This entry was posted on Friday, February 23rd, 2007 at 9:58 am. It is filed under Concert Reviews and tagged with Caesar, Danny Armstrong, David Ewell, Devin Hoff, Dina Mccabbee, Geechi Taylor, Howard Wiley, Intersection of the Arts, Jeannine Anderson, Jemal Ramirez, Lorin Benedict, The Angola Project, Yeruda. You can follow any responses to this entry through the RSS 2.0 feed.